Where? You're forgiven if you've never before heard of Whittier. Although it's a gateway to the glacier- and wildlife-filled Prince William Sound, most people have had no reason to go there. Except -- and this is a big except -- Whittier has experienced a boon as an alternative embarkation and disembarkation port to ship-crowded Seward. 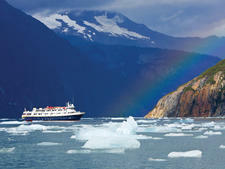 Princess Cruises primarily homeports ships here for the entire Alaska season. Despite the sound views, quaint it's not -- the feel is very industrial and military. (The town holds a strategic position on the Alaska Railroad and at the head of a deep fjord; during World War II, it was a key port in the defense strategy for the state.) Weather is often nasty, with whipping winds and lots of rain, particularly in the winter. Still, the tiny city of about 200 residents is a natural benefit for cruise lines sailing Alaska itineraries, actually more than an hour closer to Anchorage than Seward. (It takes about 90 minutes to get to Whittier from the Anchorage airport.) This means hundreds of thousands of cruise passengers are a part of the Whittier scene each summer. Getting into town is, however, one of the highlights of a visit: The Anton Anderson Memorial Tunnel is like no other. You enter what looks like a Swiss Chalet structure and ride for 2.5 miles on a railroad track through the narrow pass cut into a mountain. The tunnel is actually shared by rail and vehicle traffic -- when one is inside, the other is not; they switch every half-hour. 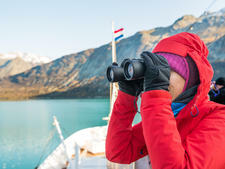 If you are planning an overnight stay before or after your cruise, we highly recommend staying in Anchorage because there is much more to see and do in town, and there are more accommodation options. 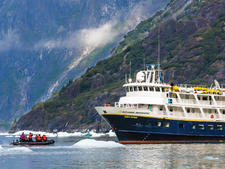 However, with Prince William Sound just steps away, there is plenty for cruisers to do with a few hours to kill in Whittier. Included are a few suggestions for what to do with one day in Whittier if you are feeling a bit adventurous. The cruise ship terminal, located at the mouth of Whittier Creek, doesn't offer much, other than efficient check-in and disembarkation facilities; a rack offers brochures on tours, eateries and the few existing shops. Passengers disembark in the heart of a tiny business/residential district. 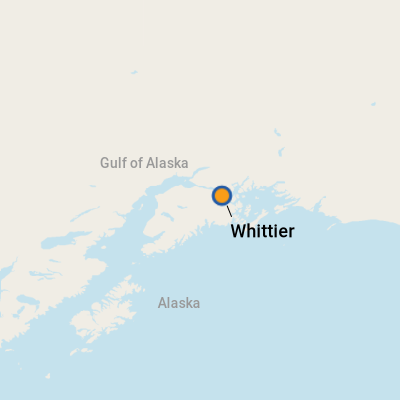 Whittier has more use as a staging ground for getting out on Prince William Sound. The town itself is rather industrial. There is a cruise ship terminal, where you can pick up a guidebook. There are a few restrooms around the Small Boat Harbor. It rains a lot in Whittier; bring your rain jacket and managed expectations. Even if the tour you're on boasts 26 glaciers, you might only see one or two due to cloud cover (still, the one or two are pretty amazing). Thusly, resign your sightseeing around Prince William Sound to fate. On Foot: Once in town, there is no need for taxis or shuttles -- everything in town is within walking distance. By Bus: For people who are coming independently from Anchorage and do not have a cruise line transfer, check out The Magic Bus, which departs from the Anchorage Museum (7th and C streets) at 9:45 a.m. daily, May through September; the trip takes about 90 minutes, includes narration and picture stops, and drops at the Princess dock at noon. For reservations, call 800-208-0200. 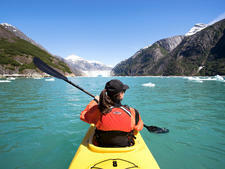 You can also get there by train: Call the Alaska Railroad at 800-544-0552; the trip takes about 2.5 hours. By Car: If you're driving to or from Whittier be sure to have the schedule for the historic Anton Anderson Tunnel -- built during WWII, it's the only way in or out. Open to vehicles since 2000, the tunnel is used by the train and cars, but in one direction at a time. Be sure to catch the next opening in your direction or you might be waiting in line for another hour. Currency is the U.S. dollar. An ATM is available at the Harbor Store (also the site of the Avis Rental Center) at Lot 8 Small Boat Harbor. The dining scene in Whittier is eclectic, simply because there is not a ton to choose from. You'll find fresh doughnuts, solid Chinese food and heralded fish 'n' chips, but dietary restrictions could prove cumbersome. Head to the waterfront to dine at one of the few but reliable restaurants. China Sea: Korean-owned and doing Chinese food well for years, China Sea features specials like kung pao halibut. (6 Harbor Road; 907-472-2222; open about 11 a.m. to 11 p.m. daily). Shopping isn't a major draw in Whittier, but Log Cabin Gifts (907-472-2501) provides some of the most unique handcrafted items we found during our entire Alaska trip. Handmade leather bags, ornaments and other Alaskan mementos are designed and made by Brenda, a resident for more than three decades who also happens to own a pet reindeer. Perhaps the the most rewarding souvenir is catching a huge sockeye salmon to ship home (or you can pick up some fresh seafood already caught for you, namely PWS' famous spot shrimp at Alaska Seafood. 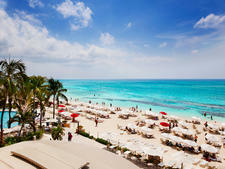 Both are located in The Triangle, an area in the harbor where restaurants and shops are clustered.